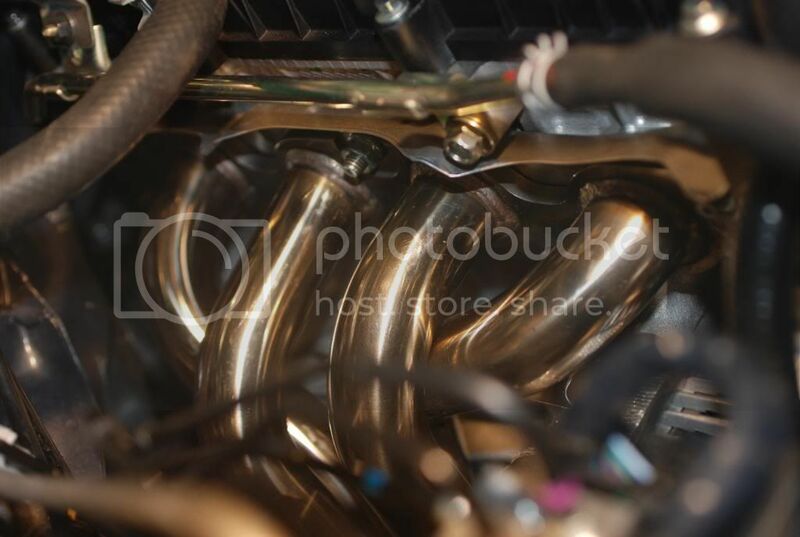 This install thread is dedicated to our RoadsterSport Brand Headers in particular. 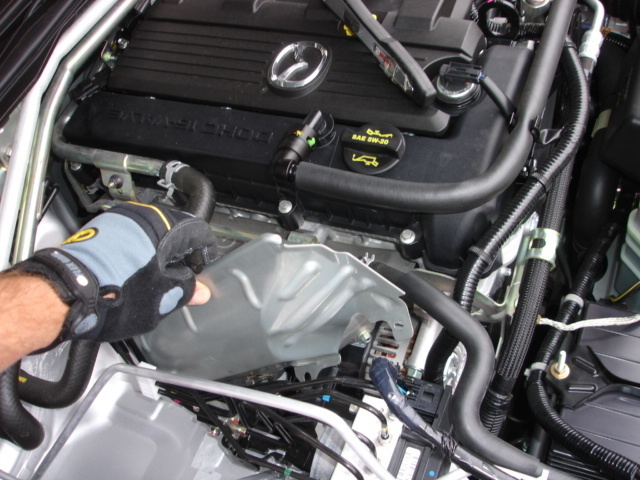 Though the procedures below may prove helpful for install of our other brands of headers on the 2006-2014 MX5 Miata, we don't pretend to cover here any and every challenge you might run into with install of any header. Though many of the tips below apply to ND as well, the ND header install in particular starts page 7 of this thread. This install can be accomplished by a good shadetree mechanic. 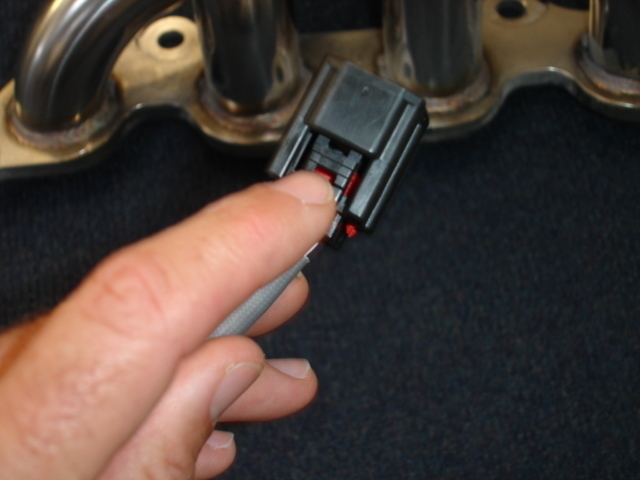 However, if you do NOT have a full set of metric wrenches, including extensions of different lengths and including wrenches with indexable angled heads for tough to reach spots, then you should have a licensed mechanic do this installation for you. Read all instructions and examine the photos below before you begin so you know where you are going! PLEASE NOTE we do NOT guarantee that ANYBODY can do a header install on these cars, exercise some judgment after reading this thread about whether or not you should hire a professional to do this install. Also note the optional O2 extension cords, which not everybody will need...but many will find very helpful. First, place the car on ramps or jack stands (NOT JUST A JACK). 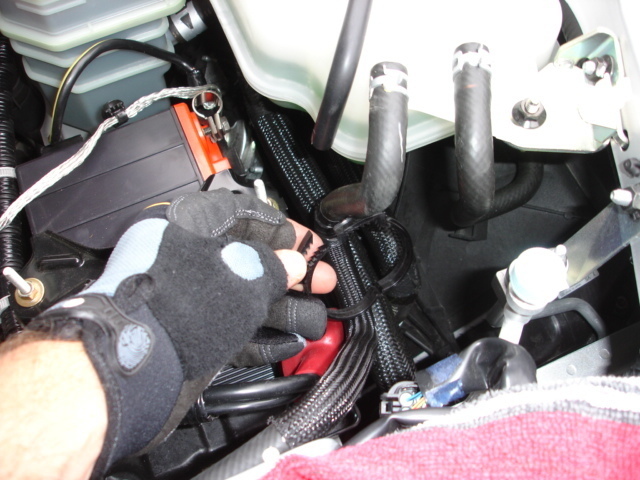 Remove the outer chassis-mounted heatshield shown in the picture below in my hand. It is important to wear gloves for this install because the heatshield edges can be razor sharp! This item will be reinstalled so place it safely aside with the hardware that connects it to the vehicle. If equipped, remove passenger side and center portions of the strut brace. 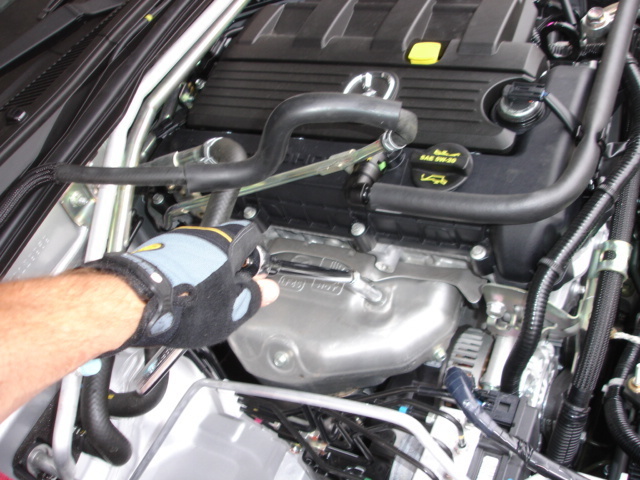 Remove radiator cap to relieve pressure on the system and then unbolt heater coolant line from above exhaust manifold and disconnect the line by using a wrench to pull off the clamp you can see here to the right of my hand. You will drip about a quarter cup of coolant from this high point in the engine bay, I used a small shallow bowl to catch this fluid when I opened the connection. Pull the battery cover (you see here my race battery which is smaller than your standard battery). To create more space to get the factory header out you need to disconnect this small plastic hose clamp. Notice that it is reuseable so you don't want to break it. You can pry it open with just your fingers, no need to use a wrench on it. Save it because you will be installing it again at its original position. Now that you have created some space, remove the heatshield from the factory header. It is two parts and the upper "cap" part is held on by numerous little 10mm bolts. Neither part of this shield is reused. Continue removal of the factory heatshield by removing the lower portion of the heatshield. You will need to bend it slightly to get it out but it will easily bend back to original position. This gives you access to the 15mm nuts that hold the header to the motor. Spray the nuts with WD-40 and leave for an hour. Do the same with the 14mm flare nuts under the car that hold the spring connection between header outlet and midpipe (don't spray where the studs connect to header on this downstream connection...just the nuts on the end of the studs against the springs). There is a third connection point between the head and the outlet, to a bracket...spray those two 15m nuts too. Crawl under the car (which again...should be on JACK STANDS or ramps but NOT JUST A JACK). Remove the 5 bolts that retain the cover plate plate directly below the oil pan and factory header to get access to the O2 sensors. Remove the plate for access. Unplug the two O2 sensors. Note these are simple plugs that each have a release button which I have my finger on below. All you need to do is squeeze that button with your thumb while you grip the plug to release each plug. You do this by reaching up from below the car. Note that we have no O2 sensor connection in our Max Power header....in part to keep flow as clean as we can get it but also because we could see no purpose in locating them in the header since doing so will throw a code because pulling the factory header includes removal of the first catalytic converter. Several choices on what to do with the O2 sensors with our header. Choice ONE is to simply leave them out of the car and you will throw the same codes as if they were in the header....but run the default "safe" map which is too rich (you won't make more power and car won't have feedback it needs to properly trim fuel....which is a BAD idea). Choice TWO is a much better choice which is to buy our midpipe which is designed to take both O2 sensors...and includes two O2 sensor connections...one before the midpipe's converter and one after the midpipe's converter to help avoid a code but you need to extend the wires to reach these locations...or buy our extension cords to make it all plug and play. Note that our extension cords use a thermal jacket to protect the wires but you must route them carefully because the plastic plugs on the ends WILL MELT if in direct contact with exhaust). Third choice is equal to the second choice but takes more work: have an O2 bung welded by your local muffler shop before and after the factory second converter in the factory midpipe to replicate the setup we are doing with our midpipe. Choices two and three require extension of the O2 wires which are on this website in the exhaust section. With our RoadsterSport street header we consistently find we do not need the extensions...if we release where the factory O2 wires are attached to the retaining bracket (just follow them until you reach that bracket and release them from that bracket). NOTE: IF you follow factory plugs for the O2 sensors back from sensors you will find they are attached to plugs that are attached to a bracket, AND you can easily release them from that bracket to get a few more inches of length. For the RoadsterSport Catted Street header you need to do this release from the bracket....or you need the first short extension cord we offer on the site for the first O2 sensor. Feel free to order the order so you have it handy....and return it for refund if you don't use it. 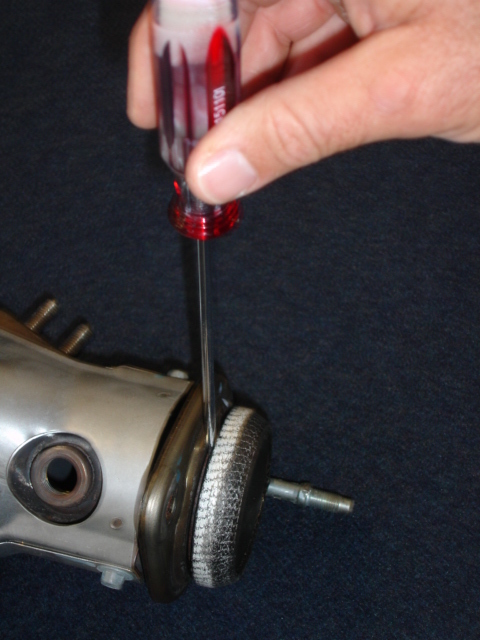 Remove the 15mm nuts which hold the header to the motor. Again use some liquid wrench on the 14mm nuts that hold the lower connection to the midpipe and remove with 14mm long socket the nuts and studs. There is another connection point about 5 inches up from the downstream connection...remove the 14mm bolts that hold the converter to the heavy steel bracket at this point and remove the bracket which will not be used again (it supports the substantial weight of the factory converter and is not needed for the much lighter header you are installing). The header can now be removed. HOWEVER, HERE IS THE KEY TO MAKING THIS PROCESS EASY. Leave factory header manifold gaskets on (stainless steel sheets on this car and used over and over, not crush gaskets). I removed the factory header several times without doing this next step and it was very difficult until I figured out that you can easily tilt the alternator forward by removing two bolts...and with the alternator tilted forward the factory header assembly will come out easy. The alternator has three 14mm bolts holding it to the block, one bolt on top and two on its underside. Back out (without removing) the underside bolt in the very bottom left of the picture below. Then back out the top 14mm bolt (without removing) and the alternator can be tilted forward and the factory header easily pulled out. Now the factory header can be easily removed! 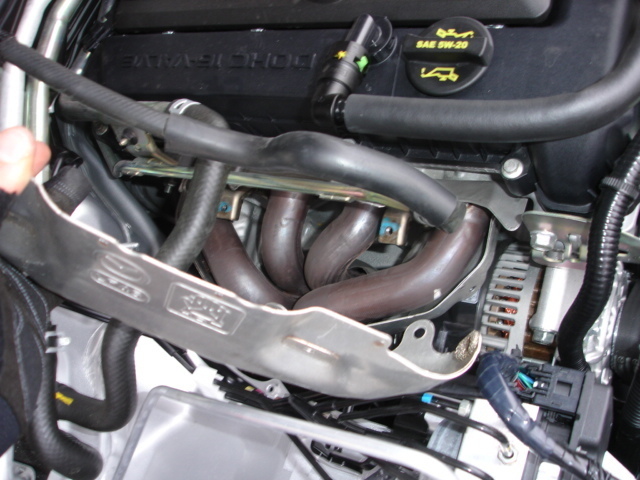 The factory gasket for the header connection is reused. The factory gasket for the downstream connection is also reused...just use a very thin edge (such as on a small flat tipped screw driver) to GENTLY pry it off the factory header as shown and then slide it onto your new header. Before installing your new header cut the provided thermal tape into two pieces (note tape not supplied or needed with our ceramic coated versions but buyers of ceramic versions should chase the threads on header outlet with 10x1.25 thread chaser to clear coating from threads). This tape is provided for the alternator rear case. We tested the header without doing this step with a temp probe on the alternator and never found the temperatures reached levels of concern with the first primary tube a good inch above and behind the alternator but in an abundance of caution we use this tape to give the alternator's protective case some extra protection. Clean the black plastic protective case on the rear section of the alternator and cut the tape into two pieces. Remove the backing and apply this thermal reflective tape sections side by side to cover the portion of the rear alternator case that will face the first header primary. Congrats, the hard part is done. Now drop the new header into place aligning the outlet to the midpipe connection below and finger tight the nuts that hold the header to the head using liberal amounts of anti-seize compound. As you likely noticed in removing the factory header, the lower connection is a spring loaded connection that uses nuts on studs. You removed the nuts from the factory header and now you remove the studs (if you have not previously done so) and springs and add them to your new header in the same manner as they were installed on the factory header. CAUTION: If you slam the nuts all the way to the top of the studs during install you may find it very difficult later to get the nuts separated from the studs...if this happens you can take that stud to your local autopart store and get a replacement if they have the same (not likely) or a metric threaded bolt of the same spec and slightly longer (at least quarter inch longer) to make install with the spring connection easier---again use liberal amounts of anti-seize. Torque manifold nuts to 25 ft/lbs. Torque the downstream sprung connection (yes, you want the springs compressed) to 17ft/lbs. Reinstall main heatshield and reconnect coolant pipe above header as before. Picture below shows the only way you are going to get the alternator back into position. You need to take the tension off the belt. 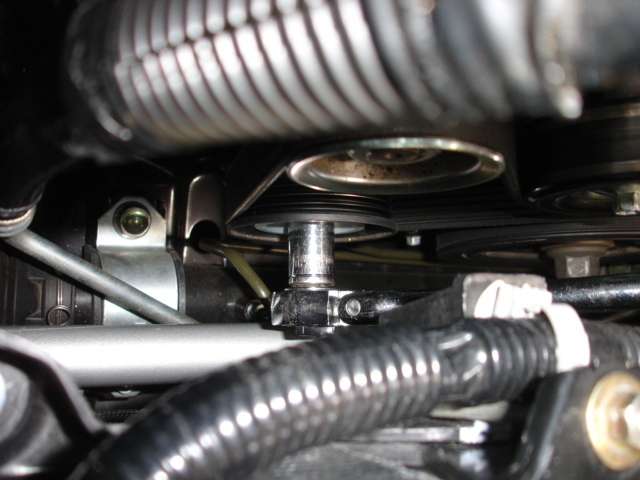 Notice that the spring loaded tensioner is the pulley immediately under the alternator pulley. You need a 14mm socket on a long wrench to reach it and then apply torque clockwise (pushing wrench toward driver's side headlight) to take the tension off the belt so you can thread your alternator bolts back in...having a buddy at this point is helpful. Reinstall cover plate under the car and torque nuts to 18 ft/lbs. 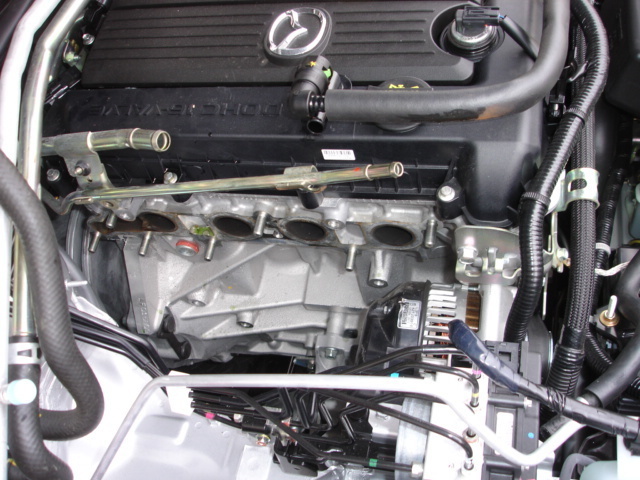 Now reconnect coolant line and attach it again to engine block with original hardware, reorient the line as originally installed including the plastic clamp that holds it organized up by the overflow bottle. 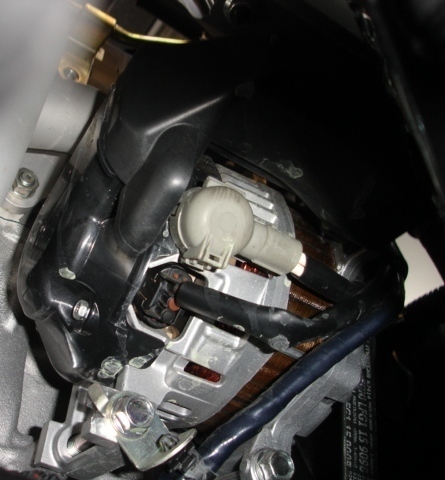 Install the main heatshield again which protects the brake lines from radiant heat. Please do NOT use header wrap on any header we sell, it traps moisture and no header maker will warranty a header with header wrap. Instead, consider our TDR heat blankets (which don't trap moisture) or our ceramic coated versions or nothing at all (stainless material is already MUCH more thermally efficient than mild steel used in cheaper headers). Now drive and have some fun....check torque after 100 miles on all nuts involved in this installation. Last edited by Brian on Fri Jul 03, 2009 11:32 am, edited 4 times in total. The install will be easier on newer cars in that the bolts shouldn't be too badly rusted. It can still be done on older cars. You may want to consider buying new bolts for the connection between the Mazda Header and catalytic converter. On every Honda that I have done, the gasket between the head and exhaust manifold is metal. You can reuse this or pick up a new one for about $20. You may also need to buy a donut gasket for the civic/integra header. This procedure is the same for Civics/Integras and Preludes. I'll note any differences. Just finished the install. Thanks for all of the tips Brian. I have worked on quite a few cars over the years and this install is pretty straight forward but the amount of space to work in is very limited. It took me 6 hours as I ran into a tough nut to remove. I had a tough time with the lower header bolts and the lower bracket that holds the header in place. All I can say is have a variety of sockets, wrenches and plan on going under the car many times. Make sure you take off the two small nuts that hold the lower bracket to the header and then remove the bracket. On of the nuts on my bracket was cross threaded and I had to finally break the bolt with my breaker bar. When I removed the old header the metal gasket and heat shield stayed on the block so I just reused then as they were. I will put the first heat shield that Brain shows in step one but I left it off for the pictures. I have the rsII duals and rs midpipe and plan to install the 02 sensors in the midpipe. I will update my driving impressions tomorrow and I plan to test it out at Laguna Seca 12/3. I found the original factory heat shield difficult to reinstall after the new header was in place. The old factory header had mounts for screwing in the heat shield. the new header doesn't. what's the best way to re-fit this item? [quote="Mk3"]I found the original factory heat shield difficult to reinstall after the new header was in place. The old factory header had mounts for screwing in the heat shield. the new header doesn't. what's the best way to re-fit this item? The instructions above note that the outer shield attached to chassis is reused...but neither of the parts that wrap around the factory header are used again. somehow this line was lost in the print. good, didn't like this heat sheild one little bit. 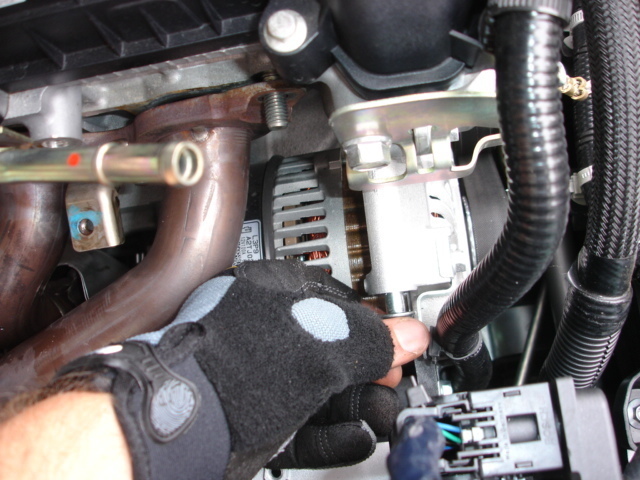 It also says, however, that a thermal tape should be provided for the alternator. But I didn't find any such tape in my box or in my friend's (username "Senda") box. 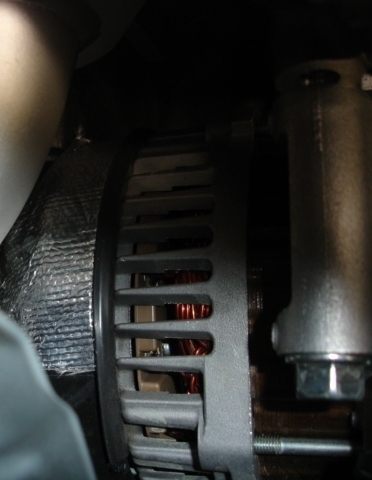 Since I'm a little hesitant about taking the risk of alternator overheating, what would be your recommendation? Both the AEM and Racing Beat headers are just as close to the alternator and don't provide the tape. Thus, the tape is extra precaution...but have buyer email us and we can mail some out. When I was trying to get access to the alternator pulley bolt, I couldn't quite get to it since I had to use an adaptor on my wrench. What I ended up doing was pulling the battery and the battery tray and that gave me plenty of clearance. Becareful as to not drop the hooks down as that's a pain to get out. There's a total of 4 10mm bolts at the bottom. Take them out, and then pull the clips off the sides that holds the positive cable and ground to the tray. As for the alternator bolts and the 14mm nut that holds to the header bracket in place, I found that it was easiest to get them loose from the top as opposed to the bottom. #1 tool that I wish I had was probably a set of those ratchet box wrenches. Just did it yesterday. I also pulled the battery box as it opens up the alternator bolt access from the front and top rather then trying to do that from the ground. All you have to do is loosen the J bolts that hold the battery down, you do not have to unbolt them all the way, they just hook to the tray. I loosened all the alt bolts and removed the upper and rear lower completely to allow the alternator to pivot, just seemed easy to do. 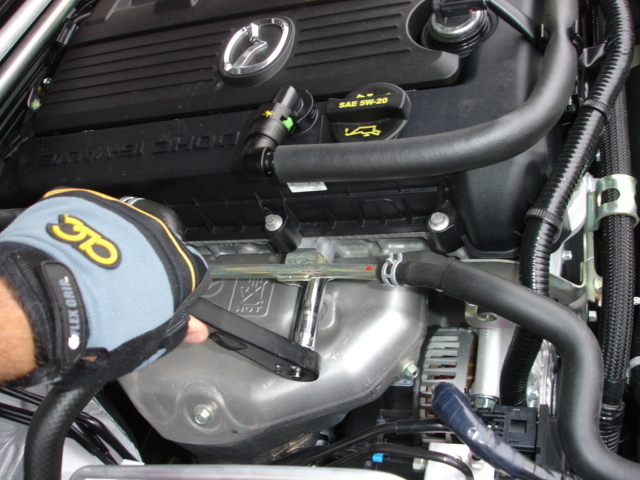 Removing the battery box also makes it a breeze for access to the belt tensioner, makes it an easy one person job. The only other comment is the short O2 wire is too short, by about 2-4 inches, for an easy plug and play fit. I found I had to disconnect the socket from the engine bracket to allow enough room for connection and placement away from the pipes. I also installed the brake line heat sheild bolts from the top when I put it back on. The access from the bottom is pretty poor, I used a couple of oil pan drain washers to cover the welded nut and allow a tight fit on the middle attachment point. I had enough of crawling under the car by the time I was done. No problem with any fasteners on my 3 year old car. I removed the heat shields the night before and soaked everything with PB Blaster a couple of times before I tackled it. I had 0 problems with my 3 year old fasteners as well when I installed this fall. I was able to do it without touching the alternator however, not sure if its actually more complicated the way I did it, but I basically took all the heat shielding off of the stock header and then with alot of wiggling I was able to pull the old one out.